Isabell Norstedt during running analysis. 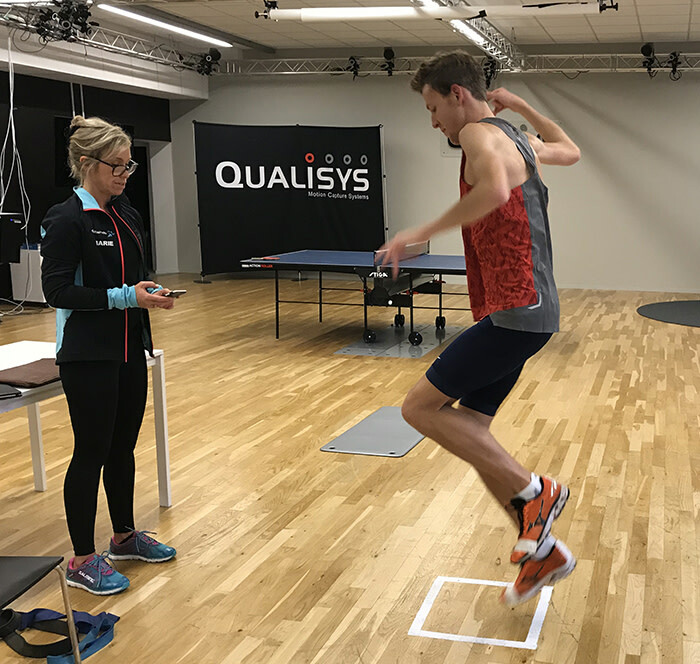 Last week, ten elite runners from Malmo Athletic Club (MAI) and Malmo Sports Academy (Malmö Idrottsakademi) visited Gothenburg for an intensive and unique testing of elite runners at the Qualisys Headquarters’ High Performance Running Lab. Qualisys technology provides a complete 360° full-body analysis of the athlete’s technique and a detailed assessment of performance, from head to toe. 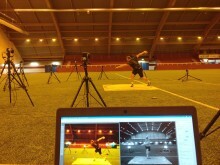 Every movement is recorded and immediately made available to the athlete and the coach to review. In running, as in many other sports, it is critical to measure the athlete’s technique and the functional capacity the body to verify that it is on the same level as the demands of the sport, especially during pre-season. 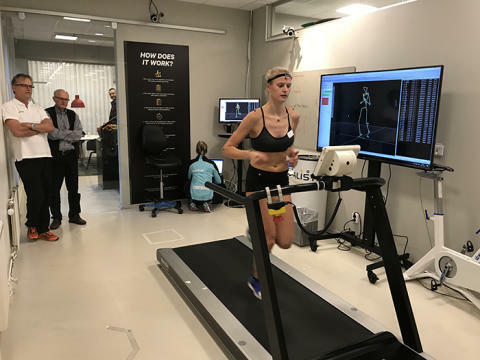 Running expert, Peter Fröberg, from Fröberg Competence and Sports Physiologist, Marie Larsson, from Elitrehab exhibited the need for these pre-season measurements as they performed running analyses and functional tests of all the athletes. Below Marie Larsson, Elitrehab Physiotherapist, tests athlete, Anton Danielson. Every runner received a comprehensive review afterwards as well as individual recommendations for the pre-season training period. What do they have to focus on to get a better running technique? What exercises do they have to do to perform better and avoid injuries? 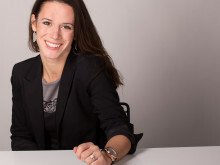 “I have followed the development of motion analyses systems in sports for several years and I find Qualisys to be the most advanced and the most suited system for running analysis so far. 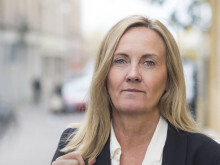 Every coach has opinions on how to improve the technique of his athletes,” revealed MAI coach Ola Thorsson, “With Qualisys you can not only get objective feed-back and confirmation of the strengths and weaknesses of your athletes but also detect new areas of improvement that were not seen before. In the beginning of next year, the runners will receive follow-up tests to see the results and improvements and to update the recommendations depending on the new results. All information is objective and research-based by technology that has been used as a scientific and clinical method for decades. “The analyses together with the expert opinions of Peter and Marie have revitalized my coaching and increased the motivation of my runners,” she continued, “At our follow-up tests next year, we are very excited to see the results of the new specific training efforts that we have applied this season." Malmo Athletic Club (MAI), is a sports club in Malmö, Sweden. MAI is the most successful club over the recent years due to the number of National Athletic Championship gold medals. The club is represented annually by a large number of athletes in the national teams of all age groups. In 2012, MAI won both the Youth National Championship for teams and was honored as the best club at the World Youth Games in Gothenburg.